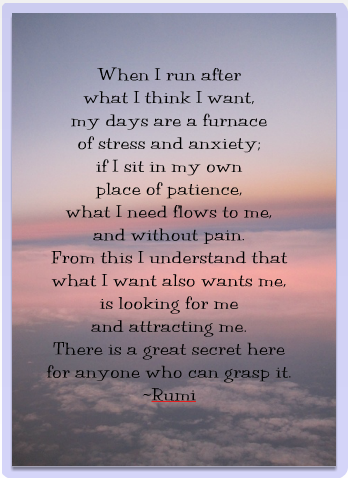 Rumi and other Sufi poets provide practical wisdom after 800 years. Viktor Frankl wrote that we do not find meaning in life. Life finds meaning in us. Patience and quietness are important in the listening we undertake to let that meaning reveal itself and speak to us. There is a great secret here for anyone who can grasp it. How can meaning be deciphered with our cognitive engine engaged? I agree. When we sit and are patient, the wisdom is revealed. Parker Palmer says the soul is like a wild animal and needs quiet to emerge. When we stop the monkey mind, the soul appears. Wonderful thoughts. It reminds me of what are referred to as the “virtues” in 2 Peter 1. Assuming that self-control carries with it the idea of patience, I notice that the next ‘add on’ is perseverance, and if and when you achieve that remarkable ability, godliness comes next. It’s no longer surprising that mankind has yet to reach that level of accountability. We tend to hope someone else will be responsible. That is a pretty powerful pair of thinkers.